There’s something exciting about setting foot on a newly-refurbished ship, as we were able to do during a recent sailing on the Celebrity Summit. When a cruise line spends millions of dollars to update one of the older ships in their fleet, they are taking on a major challenge. After all, the ship clearly has a whole lot of fans who come back time and again and feel at home on their favorite ship. But updates can help introduce her to a new audience. The ultimate objective: To satisfy both groups by literally making something old new again. That was exactly the goal Celebrity Cruises had in mind when in 2018 that they announced their intention to invest $500 million in a fleet-wide renovation. 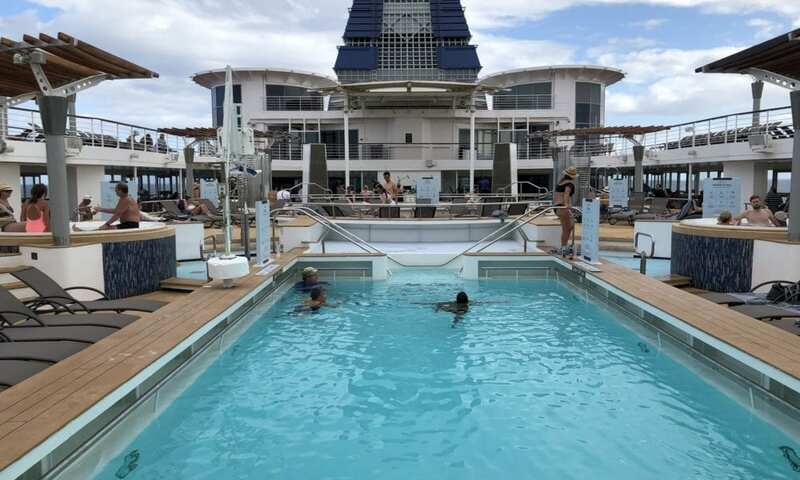 This program, known as Celebrity Revolution, was designed to bring all their ships up to the standard of their newest vessel, the Celebrity Edge. The first ship to get the treatment was Celebrity Millennium, followed in short order by Celebrity Summit. So what changes came about on Summit as a result of the refurbishment? We recently spent a few days on board to find out exactly that. Interior room on Celebrity Summit. Celebrity didn’t simply throw some new sheets on the bed and lay a little bit of new carpeting. Instead, they basically stripped the rooms down to their steel frameworks and invested an average of $75,000 on each cabin to give them a completely new — and very modern — feel. Updates included new bathrooms with glass shower enclosures, new bedding and furnishings. They cabins also received technology-friendly updates including USB ports (both on the vanity and at the bedsides) and interactive MyTV programming, which was originally introduced on the Celebrity Edge. One of the public areas on Celebrity Summit. A new color scheme and modern, sometimes eclectic furnishings combine to help give the entire ship an open, airy feeling… despite the fact that they didn’t actually add square footage to the public areas. Pre-renovation, many areas on the ship featured a dark paneling-style wall treatment which wound up feeling a bit claustrophobic. Now, much of that dark material is gone, and, in the areas where it remains, new furnishings and accents help to lighten the spaces. Elsewhere, the Oceanview Cafe (aka the buffet) was given a new, sleek design as well as new furnishings and a bakery. A comfy clam shell on The Retreat Sun Deck, available only to suite guests. Several of the areas available exclusively to suite guests got remodeled during the drydock… and one major improvement in that area was the addition of an outdoor space available exclusively to them. Found on the forward section of deck 12, The Retreat Lounge is a perfect place to escape, offering a variety of loungers, clam shells, day beds and even large pillows (the size of dog beds) for those wanting to sprawl out on the deck while sunbathing. A major perk: this area now also includes a whirlpool. There’s also a newly added accessible elevator that can take you from deck 11 up to deck 12. Perhaps you’ll meet Lady Luck at the casino bar! One thing that hasn’t changed is that the Summit’s casino continues to remain a smoke-free environment. That includes the bar in the casino, which means that unlike on many other ships, even non-smokers wind up hanging out here, especially late at night. It was with that in mind that designers gave the casino’s bar a whole new look and feel, making it a true hot-spot as opposed to simply a place to grab a drink before hitting the slot machines. Perhaps nowhere on the ship is the difference between pre- and post-refurbishment as obvious as in The Cosmopolitan Restaurant. Thanks to a total overhaul, the main dining room has the look and feel of a high-end specialty restaurant. Gone are the dark colors and same-old furnishings, replaced here with an interesting mix of seating options set in a dazzlingly airy space. It’s light, bright and a word rarely associated with main dining rooms: stunning. The Sunset Bar is a great place to enjoy any time of day! Let’s face it: Most of us want to spend as much of our cruise looking at the water as we possibly can. That’s why, across the Celebrity fleet, The Sunset Bar is a passenger favorite. Here, the space — perfectly perched on the aft section of deck 10 — has been given not only a whole new look but a new feel… literally, thanks to comfy high-backed chairs which replaced the not-particularly-welcoming barstools which existed here previously. A new ceiling and other design touches combine to give this exactly the homey feel you want from a watering hole that you expect to be spending a lot of time at. Navigational bridge of Celebrity Summit. While nearly every public-facing space got a makeover during the drydock, so too did the navigational and technical areas of the ship. As a result, Celebrity Summit is now 15% more energy efficient when sailing. Considering that a ship of this caliber burns a lot of fuel, reducing emissions is huge. Celebrity Cruises as a company has already banned plastic straws from their ships and is starting to move towards aluminum water bottles instead of plastic. The ship also saw its internet abilities get a boost during the dry dock, including having more bandwidth and access points added to make connectivity quicker. Guests can also now access the chat feature (for a nominal fee) when using the Celebrity smartphone app. These various technological advances fall under the umbrella of the Excalibur project undertaken by Royal Caribbean Cruises (the corporation which owns both Royal Caribbean and Celebrity Cruises). Spend a few days aboard the Celebrity Summit, and it quickly becomes obvious that the cruise line’s refurbishment program has succeeded in helping transform one of the fleet’s older ships into one that is more than ready to compete with her newer, flashier siblings.